According to the Ohio EPA storm water discharges are generated by runoff from land and impervious areas such as paved streets, parking lots, and building rooftops during rainfall and snow events. Storm water often contains pollutants in quantities that could adversely affect water quality. Most storm water discharges are considered point sources and require coverage by an NPDES permit. The primary method to control storm water discharges is through the use of best management practices (BMPs). The National Pollutant Discharge Elimination System (NPDES) requires a permit for all facilities discharging pollutants from a point source to a water of the state. Pollutants are broadly defined as any type of industrial, municipal or agricultural wastewater. As defined by Ohio EPA, a Municipal Separate Storm Sewer System (MS4) is a conveyance or system of conveyances (including roads, catch basins, curbs, gutters, ditches, man-made channels, or storm drains) that are owned or operated by a public body, designed and used for collecting storm water. A MS4 is not a combined sewer and is not part of a Publicly Owned Treatment Works (POTW). More information about the NPDES and MS4 is available at the Ohio EPA including the Small MS4 Storm Water Permit. Licking Soil & Water manages and assists with various aspects of the MS4 Program for many communities in Licking County including: City of Newark, City of Heath, Village of Buckeye Lake, Village of Granville, Village of Hebron, Village of Hanover, Etna Township, Licking Township, Granville Township, Madison Township, Newark Township, Newark Township and Union Township. If Illicit Discharge is discovered, complete an ILLICIT DISCHARGE REPORT FORM and return it to Licking Soil & Water as soon as possible. Licking Soil & Water coordinates illicit discharge investigations, performs water quality testing on site, determines discharge source, and works with landowners to eliminate discharge. Discharge refers to a pollutant. 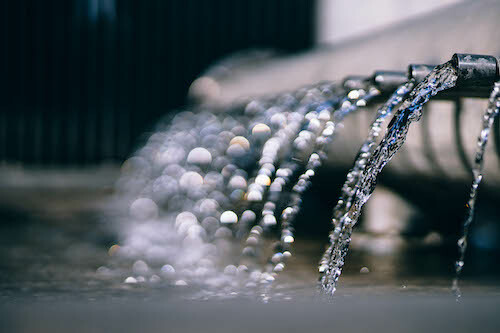 When something other than clean water is flowing out of a pipe or into a waterway is discovered, it could be polluted discharge. For example, a failing septic system may have a foul-smelling liquid flowing out of a pipe and into a waterway. Water in a ditch with an oily sheen may also be the result of illicit discharge. According to the Ohio EPA, Illicit Discharge is defined at 40 CFR 122.26(b)(2) and refers to any discharge to a municipal separate storm sewer that is not entirely composed of storm water, except discharges authorized under an NPDES permit (other than the NPDES permit for discharges from the MS4) and discharges resulting from firefighting activities. Licking Soil & Water inspects sediment and erosion controls on constructions sites in Licking County to look for properly functioning silt fencing, storm water system inlet protection, channel and stream protection, etc. We also look for proper construction of long term storm water infrastructure. Licking Soil & Water reviews new development plans with Licking County’s Technical Review Committee, a collaboration between Licking County Planning and Development, Licking County Engineer’s Office, Licking Soil & Water and other agencies. 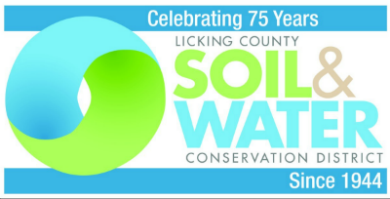 Licking Soil & Water specifically looks at construction site sediment and erosion controls, storm water pollution prevention plans, and compliance with Licking County’s Soil Erosion and Storm Water Regulations and Ohio EPA’s General Construction Permit for Storm water. If you plan to develop property in Licking County that will disturb greater than 1 acre of land, call Licking County Planning and Development at (740) 670-5200. Licking Soil & Water offers trainings on pollution prevention in the workplace for Municipal Operations. Training covers pollution prevention concepts related to utilizing and maintaining equipment; pesticide, fertilizer, and salt storage and handling; and general workplace pollution prevention. Licking Soil & Water can also assist municipalities with developing Storm Water Pollution Prevention Plans for Municipal Operations. For more information about pollution prevention training and SWPPP, contact Licking Soil & Water at information@lickingswcd.com or 740 670-5330.